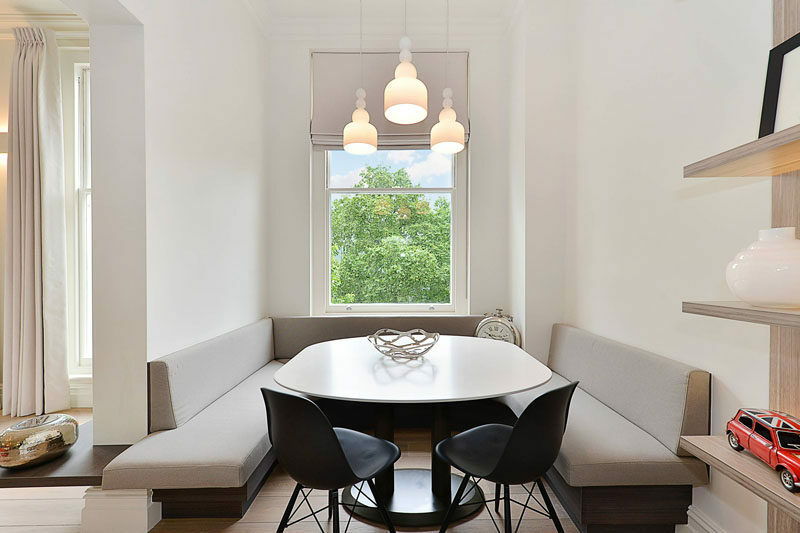 Built-in dining nooks are an excellent way to fill rectangular spaces efficiently and make sure that everyone in your family gets a seat at the table. They’re a cozy alternative to bench seating, and can often fit more people than a simple table and chairs. 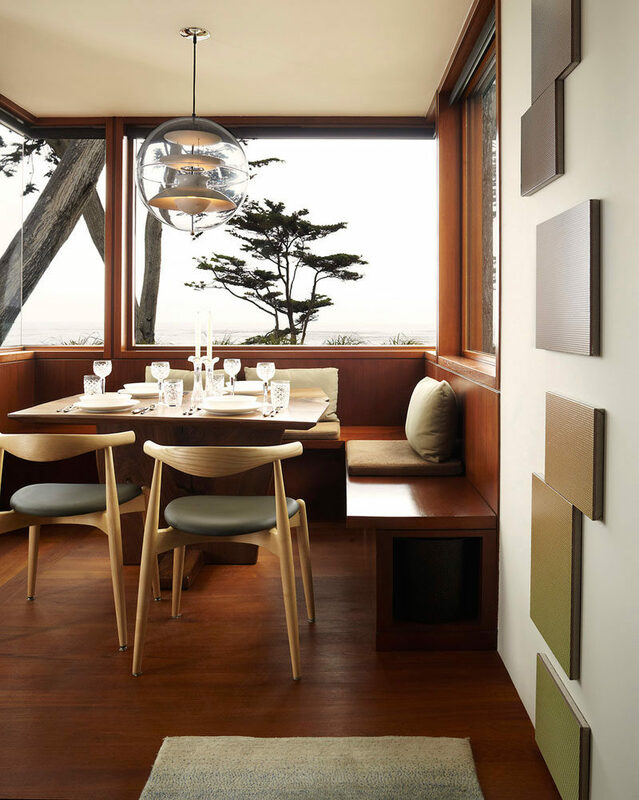 To inspire your own, here are 8 examples of clean, modern, and cozy built-in dining nooks. 1. This built-in dining nook has been sunken into the floor, with hidden drawers neatly tucked into the side. Large windows can be opened to let you feel like you’re dining outdoors. 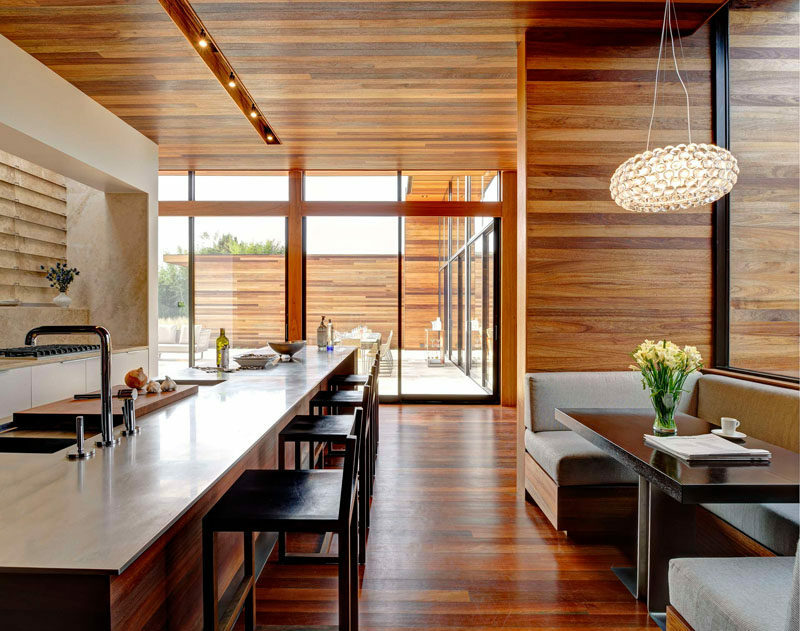 Designed by Marmol Radziner. Photography by Joe Fletcher. 2. 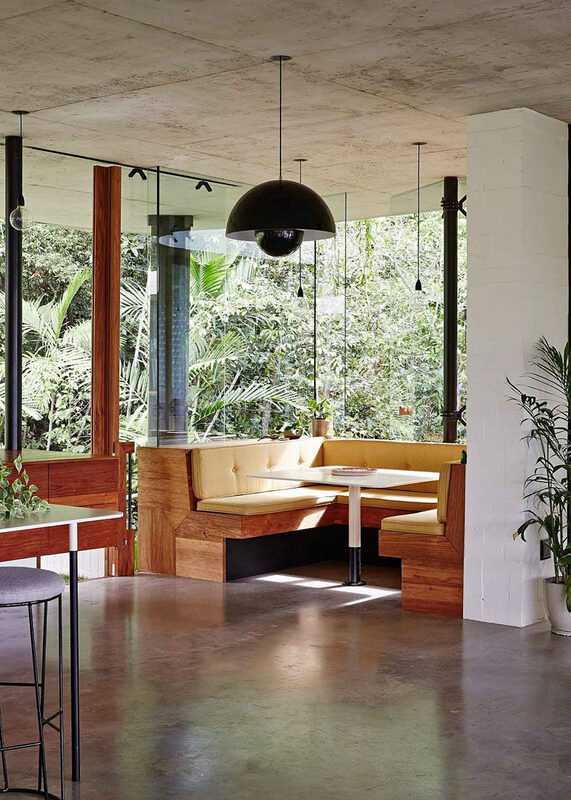 Windows surrounding this built in dining area ensure that everyone at the table has incredible views of the rainforest outside. 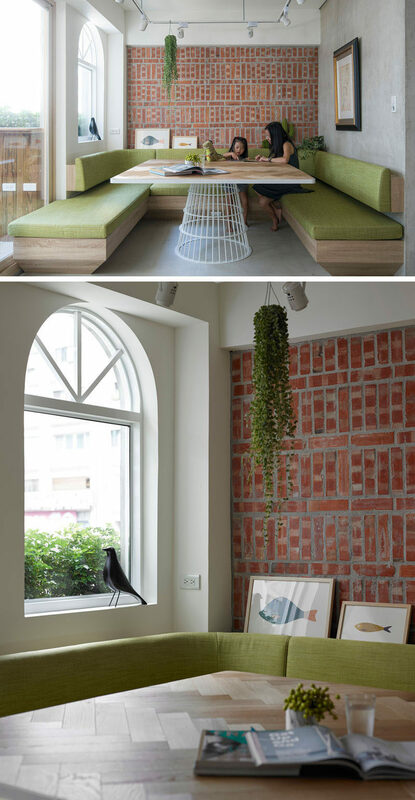 Upholstered cushions have been designed to match the dimensions of the benches. Designed by Jesse Bennett. Interior design by Anne Marie Campagnolo. Photography by Sean Fennessy. See more photos of this home here. 3. Light wood and soft green cushions soften up the brick feature wall, and make this dining area a calm place to spend time eating or gathering around with friends and family. 4. Light wood and a large window help make this small dining nook a bright cozy space, while a wall of shelves and cabinets keeps everything at arms length. Designed by Thielsen Architects. Photography by Art Grice. 5. The dark wood of the built-in seats is offset by the huge windows looking out over the ocean that brighten up the whole space. Designed by Dirk Denison Architects. Photography by David Matheson. 6. Light fabric, white walls, and high ceilings make this large dining nook a bright and airy space, while additional chairs make sure there’s room for everyone around the table. 7. 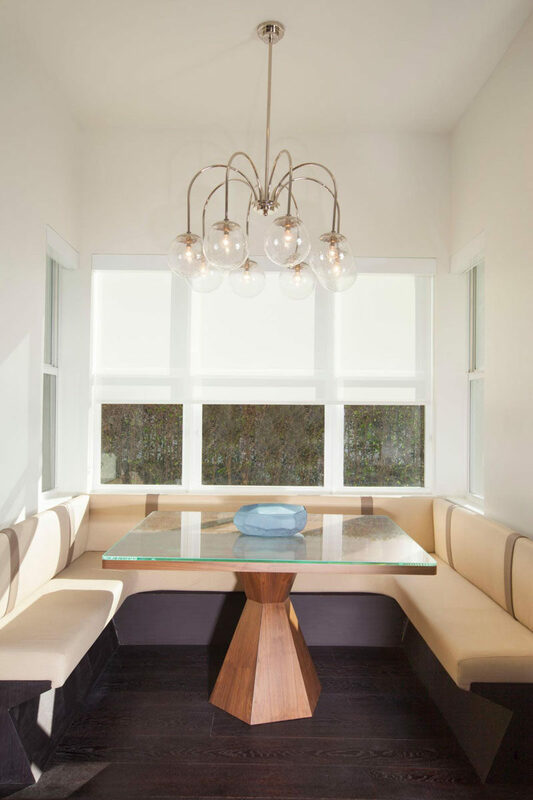 Clean lines and a custom-built dining nook fill this space that can quickly go from the place where you have breakfast to the center of a dinner party. 8. This built-in wood dining nook with gray upholstered cushions is located just off the kitchen. 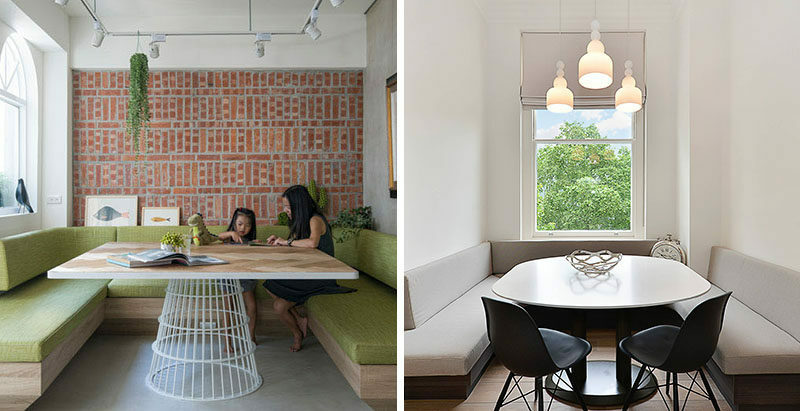 A pendant light helps to define the dining space, while large windows brighten the shared area. Designed by Bates Masi Architects. See more photos of this home here.